March Break 2018 will be happening from March 12 to March 16. Registration is now open for 2 camp options. This camp is open for grades 7 to 11 and will have very limited enrollment. To register you should be a competitive Club player or a member of your school team with demonstrated advanced skills. Athletes will be offered setter, hitter and defensive position instruction with competitive game play. This camp is open to all skill levels with groups for grades (4-6), (7-8) and (9-10). Players will challenged at their level allowing them to develop at their own pace. 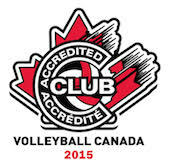 Our camp emphasis will be fun and more fun with interactive games and volleyball skill development.